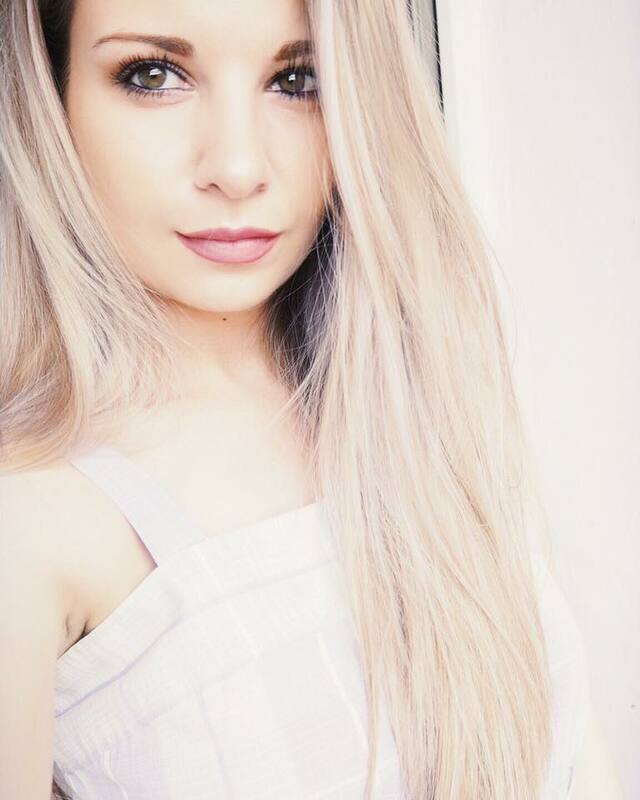 Firstly, let’s talk hair! As you may know, I highlight my hair so naturally it is quite dry and needs high maintenance. I never use the shampoos and conditioners, which we get in the hotels because let’s face it – they are not the best quality and I love taking good care for my hair. 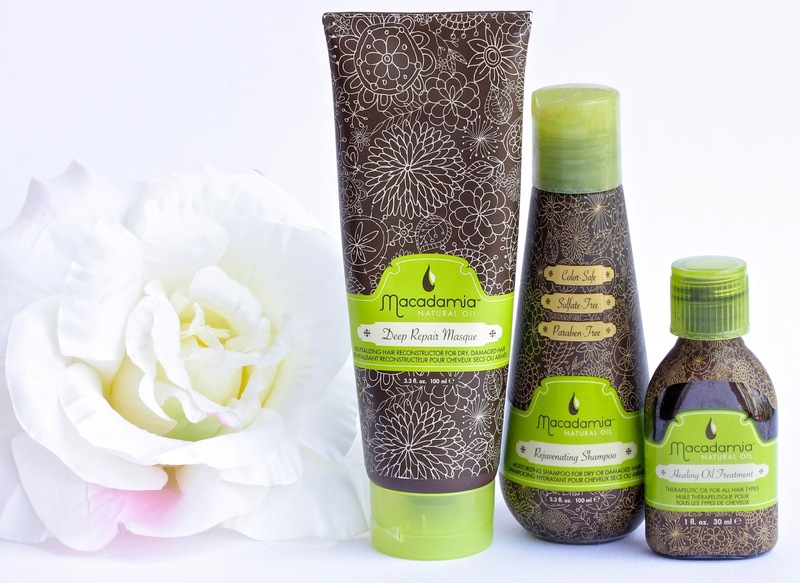 With that in mind, I decided to put in action my set of mini Macadamia products. Macadamia is hands down my favorite hair care brand and their products do such miracles to my hair. The first product I’ll be taking is their Rejuvenating Shampoo (review here), which has improved my hair so much since I’ve been using it. It makes it soft and silky; it hydrates and helps battle tangles. It also gives a nice volume and bounce to the hair. Amazing stuff and I highly recommend it! :) Next, we have the oh-so-famous Deep Repair Masque (review here). What can I say – this is the most incredible hair product I’ve tried in my life. I literally cannot live without it and I don’t think my hair can either! This masque makes my hair feel so smooth and soft, it makes it shiny, detangles it, and removes frizz as well as hydrates! What else can you wish for? <3 And of course to complete my hair routine I have to have some sort of oil with me. Since I only have a big bottle of my favorite Moroccan Oil, I decided to pack with me this mini Macadamia Healing Oil Treatment. Even though I still prefer the Moroccan Oil, this little guy is also great for the hair. It helps tame down the frizz; helps with split ends, nourishes the hair and leaves it feel and look so healthy and shiny! Moving on to body care, I decided to take with me a scrub, a shower cream and a body butter. 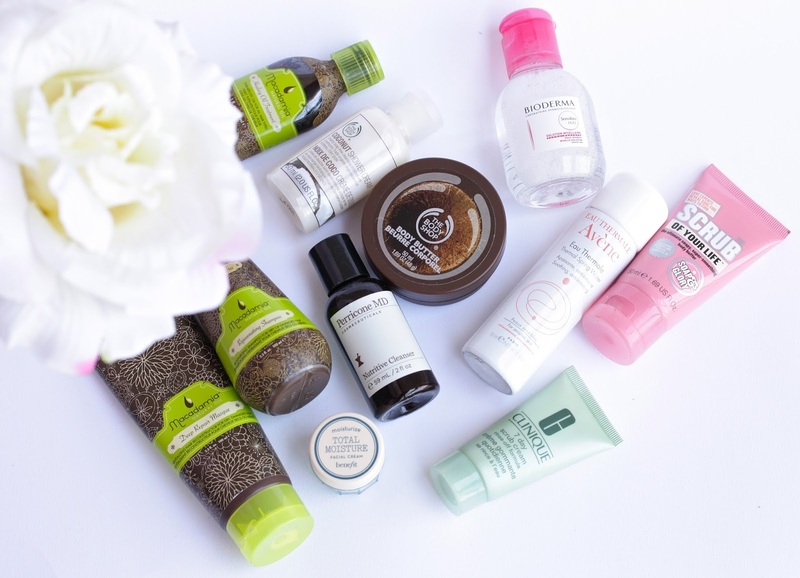 Same as with the hair products, I don’t find hotel shower gels and body lotions to do the trick for me so I always like to bring some of my faves with me. 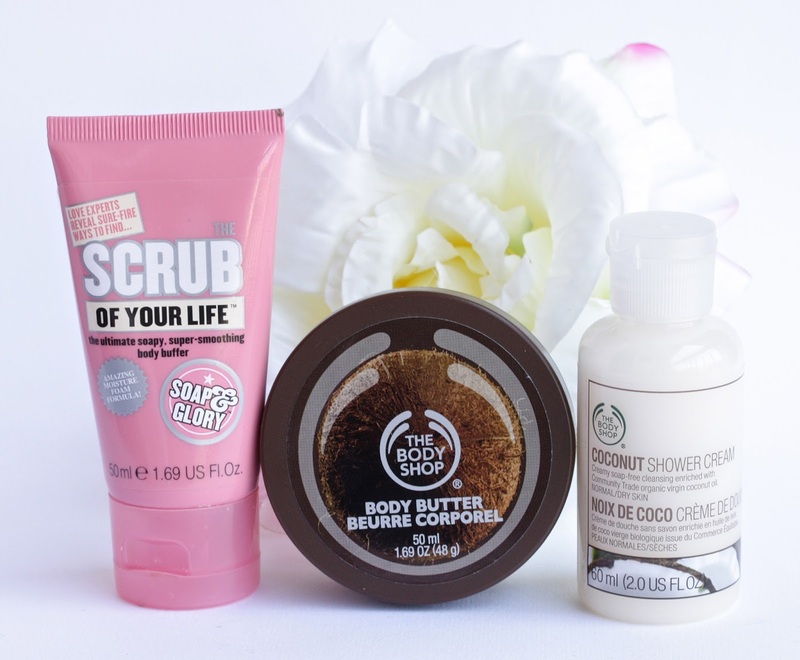 For scrub, I couldn’t fail to pack my latest love – Soap &Glory’s The Scrub Of Your Life (review here). I adore how soft and smooth this product makes my skin. It removes the dead skin brilliantly without feeling harsh or abrasive. It smells divine and doesn’t dry out the skin. Definitely give it a go because it’s seriously good stiff. :) For shower cream I had to take away with me my favorite one by The Body Shop and it’s their Coconut Shower Cream. It not only smells like yummy coconuts but it also cleanses the skin amazingly, leaving it feel soft and moisturized, which is exactly what I look for in a shower cream. Of course, I had to take the matching body butter as well and it is TBS Coconut Body Butter (review here). This is my all time favorite body butter as it smells incredible and at the same time it moisturizes my skin amazingly. Once the product is fully absorbed into the skin it will feel soft as a baby’s bum so be careful - you will be stroking yourself all day haha! Same here - will be saving space for shopping, so I alredy started packing minis for London :) Have a great trip! I love travel sized products. I usually buy them for when I go away, but also to try out a new product so Im not stuck with the full sized version if I dont like/get on with it! Such a fabulous selection of products. I really need to check out Macadamia as they get a lot of positives reviews. I can't wait to get my hands on the bioderma. I can't get it in the uk. the body shop body butters are the BEST I just finished the full size of the coconut one! The travel sizes are very usefull ! such a nice selection ! I definitely agree about using hair products from hotels! It's as good as using nothing. Haha! 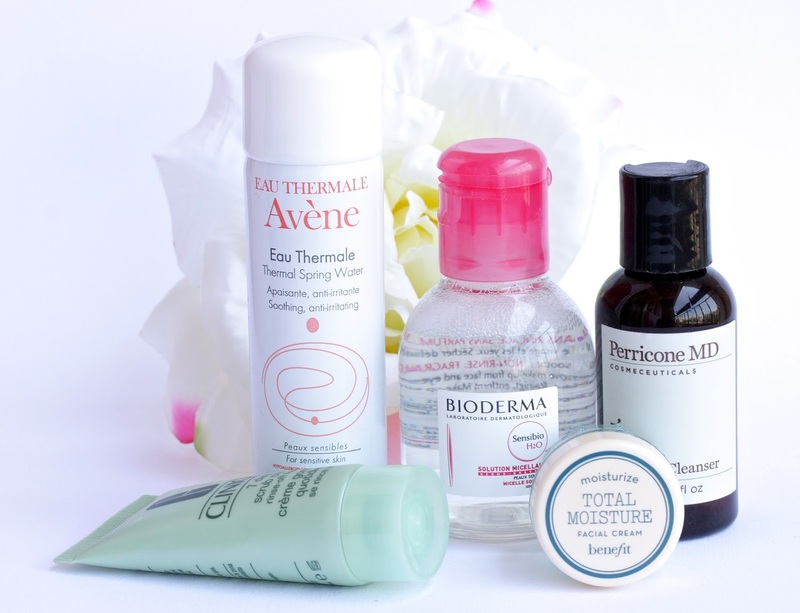 These are all great products!!! I love them!